Leeks do very well in my garden but not onions. WHY? Last year I planted the onion seedlings in a row in front of my broccoli (I read that broccoli and onions are good companions) the results were small onions, still usable but they were supposed to be much larger. Thinking they did not like the company so this year I gave them their own real estate, a bed measuring 48 inches x 40 inches. Same results, small onions. What am I not doing right? The photos below will illustrate my points. In the following 4 photos, the onions on the left were grown at Locust Grove Heritage Vegetable Garden (LGHVG). The onions on the right were grown in my home garden using the leftover seedlings from LGHVG. Exact varieties different results. Why? 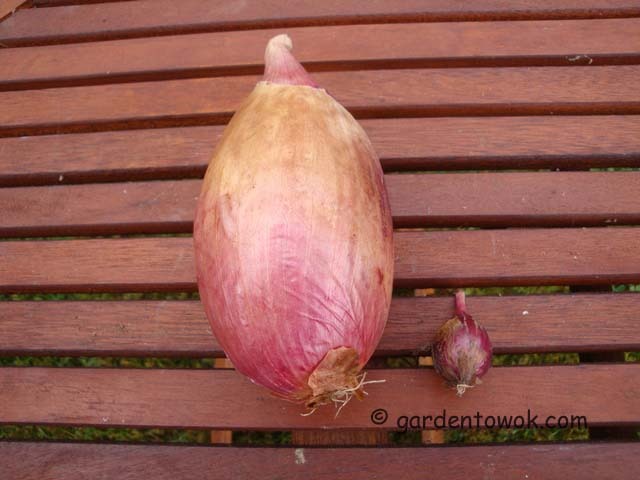 Am determined to grow normal size onions, so between now and next spring hopefully I will find the answer. Pulling leeks as needed and thinning at the same time allowing the remaining leeks more room to grow. The thinnings are pretty good sizes, sweet and tender. Parsnips are recovering from the woodchuck (groundhog) damage. I will get a good harvest after all. My napa cabbage did not like the stretch of hot dry weather especially the first 3 days of last week (Tuesday’s high was 97ºF) quite a few plants bolted. Relief came Thursday night, it poured and poured (nearly 1½ inches of rain). More rain Saturday and early Sunday morning (lawn is green again). Second half of the week was just gorgeous, 70’s – low 80’s. 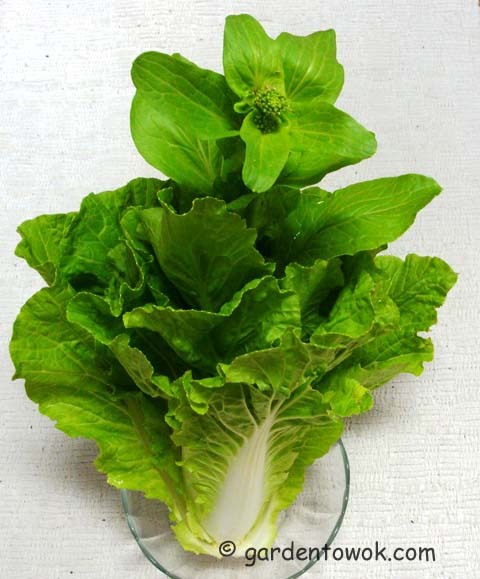 The bolted napa cabbage is quite pretty but not the result I want. With the cooler weather hopefully the remaining plants will form solid heads. Autumn is coming. The leaves on both my Katsura tree and my Gingko tree are changing color. 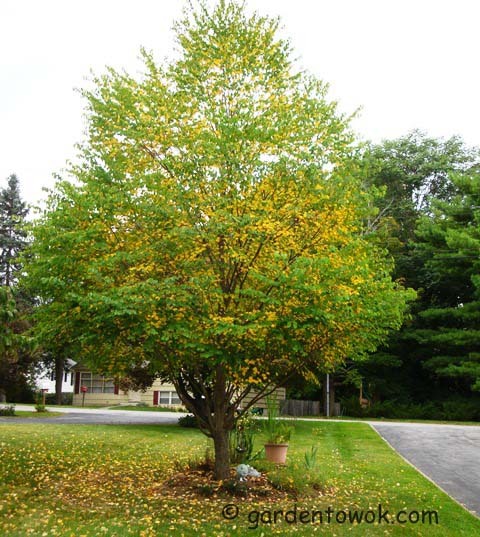 I have a single trunk (which I prefer) Katsura Tree, there are also multi-trunk ones. If you decide to plant a Gingko Tree make sure you are buying a male tree, the fallen seeds (gingko nuts) from the female tree is a smelly mess you do not want to be near. Both the Gingko and Katsura are ancient trees. Click on links to learn more about these beautiful trees. This entry was posted in Gardening, Harvest Monday, Heritage vegetable garden, Locust Grove and tagged alisa craig onion, blood red bottle onion, bolted napaa cabbage, gingko tree, katsura tree, leek, Locust Grove Heritage Vegetable Garden, maidenhair tree, New York early white onion, parsnip, southport white globe onion. Bookmark the permalink. I seem to be going through onions like crazy at my house for some reason, must be all the curries… I have no idea why they were so much smaller but hopefully they were sweeter. I love the leaves on a ginkgo tree. I never knew why when we were living in Japan they were smelly and now I do. However I love the gingko nuts don’t you? I bet you make loads of desserts and other treat with them. Unfortunately where I live good quality gingko nuts are not available. sorry to hear Norma, I bet there are many companies that do an online order for such things if not give me a jingle and we can sort you out. Thanks for your kind offer will keep it in mind. Oh that Katsura tree is beautiful, as is the gingko. Love your leaf display at the bottom. 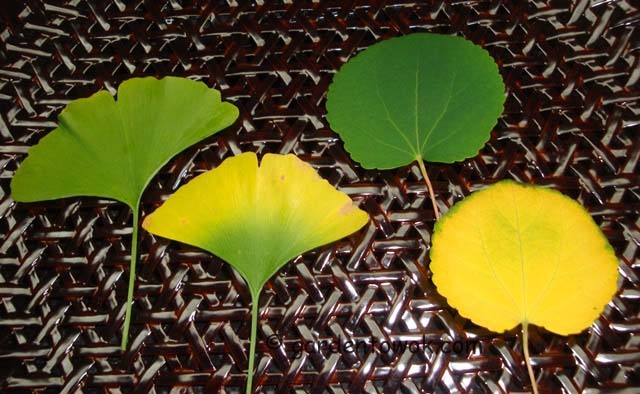 Gingko leaves are a wonder of nature – so perfect! I can’t help with your onion mystery I’m afraid – I’m still looking for my green thumb! I have bought some seedlings though Norma, and am planning to plant them with my boys soon; some nice parsley, coriander and tomatoes. Will look back through your posts for planting advice. Wish me luck! I am sure you and your boys will have lovely harvest. Drop me a note if you have any gardening questions will be happy to help if I can. I’m the other way around. 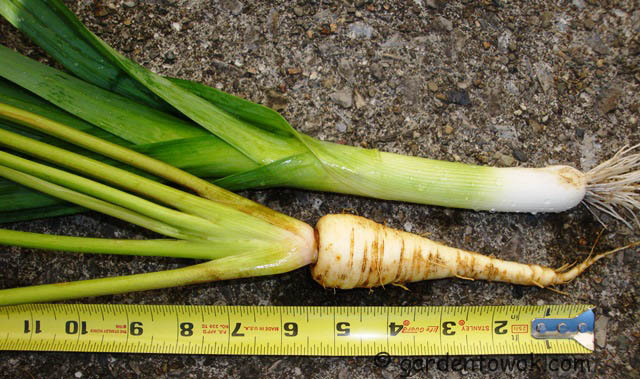 I can grow fine onions, but the leeks don’t like it. I’ve just quit growing them as they aren’t worth it. I always admire your onion harvest and hopefully I will be able to grow them successfully next year. wow gingko tree!! You are simply awesome, Norma. I just bought the plant, dug a hole and it took care of itself. Many thanks you for your dedicated & wonderfully detailed postings. FYI, an incredibly beautiful huge multitrunk katsura is on south side of College Ave, 2nd house in from Raymond Ave. It is especially impressive in early spring as blossoms/leaves unfold but do not hide the unbelievable umbrella of trunk. Thanks for stopping by and taking the time to leave a comment. I will certainly drive by College Avenue to see the Katsura Tree. That’s too bad about the onions. They are heavy feeders, so perhaps amending the bed heavily with compost and manure? I applied compost, pelleted chicken manure, composted sheep manure and kelp meal in the onion bed and they seem to respond well to that. Thanks, I was thinking that my soil needs amending, will follow your advice and add lots of compost and manure to the onion bed in the spring. I’ve seen that Ginko tree in our hood and wondered what it might be, thank you. The leaves are truly beautiful with such a unique shape. Too bad about the onions, have you done a soil analysis comparison? You would think with your green thumb everything would grow beautifully! The trees haven’t begun to turn yet, but a few more chilly nights I’m sure we’ll be seeing the first signs of fall, it always sneaks up on me. I love leeks, and I really don’t throw away the dark green bits, they make the loveliest leek broth which I freeze for those chilly winter days that neither a cup of coffee or a cup of tea fits my mood. I have my share of crop failures in my garden. Not done a complete soil analysis just pH test. My gut tells me my soil needs amending with compost and manure and will be doing so in the spring. I freeze the leek greens for making broth. 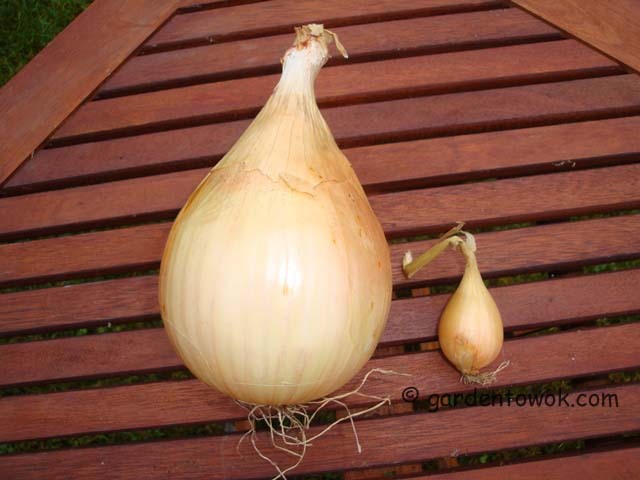 That is annteresting and very puzzling comparison of the two onion sizes. I’m with Daphne. Onions do well for me, but not leeks. But I got bigger onions and more of them last year than this year. For me in Southern California, leeks take well over a year to mature. I quit trying to grow them. 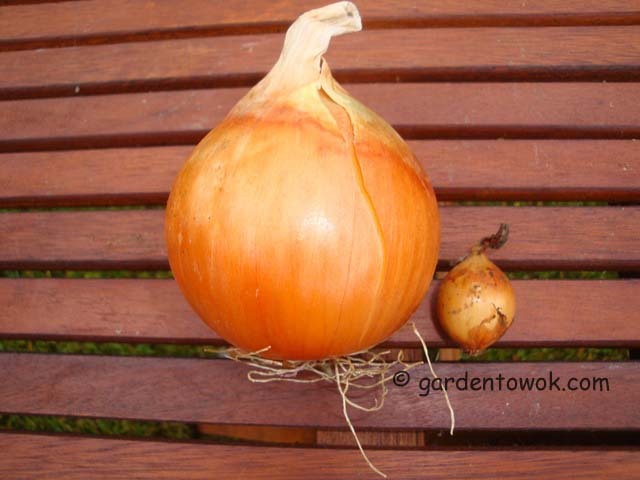 I know onions grow in my area so it has to do with my garden soil, homework for the winter months ahead. Margaret suggested amending my soil which is one of the things I am planning to do. I will admit, I am an onion fanatic. So when you finally figure out how to grow huge onions, I will be right here ready to try it. I hate buying them from the market at times. They sometimes just don’t look right. Love this Ms. Norma. Know what you mean by onions sometimes not looking right, especially the red varieties, at the market, I sure hope I get it right next year. Leeks require a long growing season, check with your local cooperative extension or nursery to see if you need to plant varieties that are specific for your area. Your leek looks lovely! Makes me want a risotto! :) I’m not sure why the onions are so small. We tried growing them one summer and also had tiny results. I’ll be curious to know what you figure out! Will post an update when I figure it out. 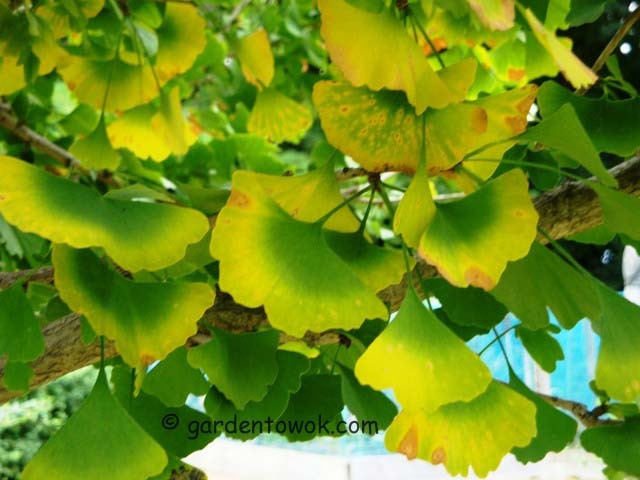 Are there gingko trees in Australia? Hope to solve my onions mystery before next year’s planting. Good luck with the onions next time! Last Fall we had a mixture of large ones and really tiny ones, it was really odd as they were next to each other but still so different in size. This year we have a a great onion harvest so my husband has been drying them. Good luck, can’t wait to see more! Thanks, I need the good luck. No matter how long one has been gardening there is always something new and challenging suppose that’s why I love gardening. We’re in southern Virginia (zone 7) so our experience may not make sense for you, but we overcame the tiny onion problem by overwintering our onions. Instead of planting in the spring, we now plant our onions from sets (the small bulbs) planted in mid-October. 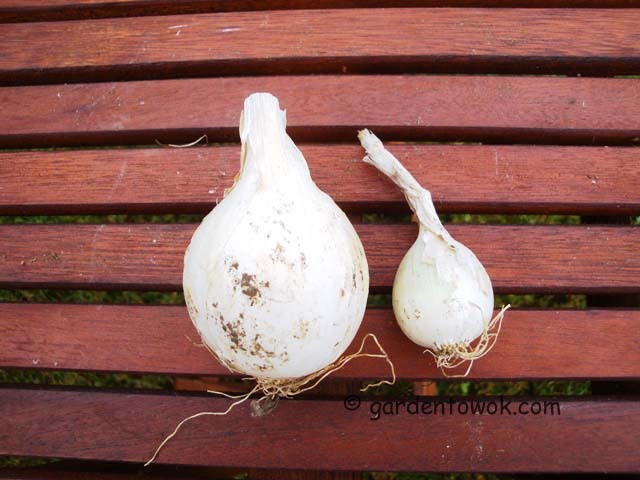 This creates some risk that they will bolt in the spring (if so we use them as spring onions) but now when we harvest our onions in July they are much larger than they were when we planted them in the spring. I don’t know if onions will survive our winter.